Treasury Secretary Steven Mnuchin plans to attend an investment conference in Saudi Arabia later in October, despite reports that reports that the Saudi government kidnapped and killed regime critic Jamal Khashoggi. The Future Investment Initiative, dubbed “Davos in the Desert,” is an annual showcase of the kingdom’s potential for foreign investors and regularly attracts financial and tech heavyweights. 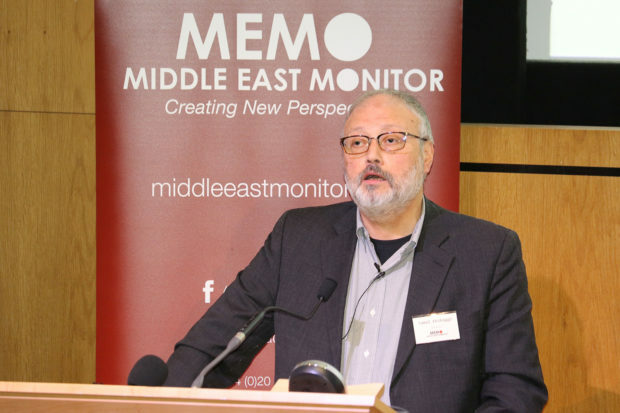 Khashoggi’s disappearance on Oct. 2 has cast a pall on this year’s conference, with key media and tech sponsors withdrawing support in recent days. Treasury Secretary Steven Mnuchin and U.S. corporate heavyweights will attend an investment conference in Saudi Arabia later this month, even as multiple reports have implicated top Saudi officials in the disappearance and possible killing of Jamal Khashoggi, a Washington Post contributor and regime critic. Khashoggi was last seen entering the Saudi consulate in Istanbul on Oct. 2 to obtain marriage documents. Turkish investigators believe a team of Saudi agents killed and dismembered Khashoggi inside the consulate, a charge Riyadh denies. Citing U.S. intelligence intercepts, WaPo reported Wednesday that Khashoggi was targeted on orders from Crown Prince Mohammed bin Salman, who had allegedly hoped to render the dissident journalist to Saudi Arabia for interrogation. The allegations have sparked international outrage against the Saudi government and cast a pall on the upcoming Future Investment Initiative, a conference aimed at showcasing Saudi Arabia’s investment potential to foreign investors. In recent days, some of the event’s sponsors, including the New York Times, have withdrawn their support. This year’s investment conference — dubbed “Davos in the Desert” by some participants — is expected to draw dozens of prominent figures from the financial and technology sectors. Along with Mnuchin, JPMorgan Chase chief executive Jamie Dimon, Uber chief executive Dara Khosrowshahi, and Blackstone Group head Stephen Schwarzman are slated to attend. The conference will be held Oct. 23-25 at the Ritz-Carlton in Riyadh, the same hotel where where bin Salman detained dozens of wealthy Saudis in what he said was an anti-corruption operation. Since assuming de facto rule of Saudi Arabia in 2017, the 33-year-old bin Salman has courted Western government and corporate leaders as part of a campaign to shed the kingdom’s reputation as socially backward petro-state. Crucial to that effort has been a public relations campaign in Western media to paint the young heir apparent as a socially moderate reformer, in contrast to the kingdom’s hidebound rulers of the past. But the Khashoggi affair has some of Saudi Arabia’s newfound investors rethinking their involvement with bin Salman’s government. Citing “deep concerns” over Khashoggi’s fate, former U.S. Energy Secretary Ernest Moniz said this week he would no longer work on Neom, a “smart city” project backed by prominent tech investors. Dan Doctoroff of Sidewalk Labs, Google’s urban innovation company, also withdrew his support for the Neom project after being named to its board of directors, the Wall Street Journal reported. President Donald Trump has been more ambivalent about taking punitive action against Saudi Arabia, even if the Khashoggi allegations are corroborated. Trump and Jared Kushner, his son-in-law and senior adviser, have cultivated close ties to bin Salman, and the administration’s Middle East agenda against Iran is heavily dependent on cooperation with Riyadh. Saudi Arabia is also one of the world’s top buyers of U.S.-made arms. “What good does it do us?” Trump responded when asked if the Khashoggi situation would make him reconsider pending arms deals with Saudi Arabia. On Wednesday, a bipartisan group of senators triggered a Magnitsky Act human rights probe into Saudi Arabia’s involvement in Khashoggi’s disappearance. The law gives the Trump administration 120 days to investigate the incident and recommend sanctions against any Saudi officials found to have played a role.